There is a lesson in American business history occurring each day in the U-Haul corporate café. The images and descriptions of an iconic woman do the teaching. U-Haul, whose moving equipment has been a fixture on the U.S. roadways since 1945, would not exist without the direction and management skills of Anna Mary Carty Shoen. U-Haul has paid tribute to its co-founder with the construction of a bright and spacious eatery in the lobby of the north tower of its Phoenix corporate headquarters: Anna Mary’s Café. In addition to shorter wait times, U-Haul Team Members can now learn about the Company’s history while they choose for an assortment of healthy entrees, salads, sandwiches, snacks and beverages. Large portraits of U-Haul co-founders L.S. “Sam” Shoen and his wife, Anna Mary, are displayed on the walls with relevant notes explaining facets of U-Haul history. 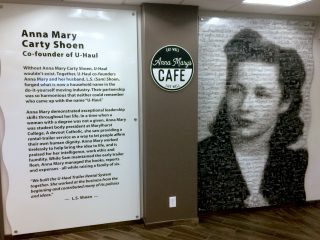 Each food station in Anna Mary’s Café is named after a significant place or date in the U-Haul company timeline. The 1945 Coffee and Smoothie Bar station honors the year U-Haul was born. When Sam was discharged from the U.S. Navy in 1945, he and Anna Mary desired to move their belongings from Los Angeles to Portland, Ore. Their search for a one-way trailer fell short. 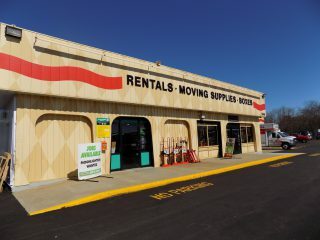 Recognizing the basic need for do-it-yourself moving equipment that could be rented at one location and dropped at the eventual destination, the Shoens formulated the U-Haul business model. The Foster Road station in Anna Mary’s Cafe serves sandwiches, wraps and soups. It honors the first U-Haul rental location in Portland. In 1945, a customer could rent a U-Haul trailer for $2 a day, although there were only a few spots along the West Coast where they were available. Today, U-Haul has more than 21,000 locations including 19,000-plus neighborhood dealers across the U.S. and Canada. Daily rental costs continue to be very low as a commitment to offering customers an affordable and reliable moving option. At the Willow Grove station, Team Members can select between salads, parfaits and oatmeal. The name honors the first U-Haul manufacturing plant location in Willow Grove, Pa. U-Haul prides itself in being a made-in-America company. The newest U-Haul manufacturing site opened last October in Glendale, Ariz.
Sammy U’s Grill station honors the Sammy U character that ran alongside equipment in company graphics and images. This is where Team Members can order burgers, hot dogs and other grilled foods. Seventy-two years after the creation of the first trailers, U-Haul is still growing. 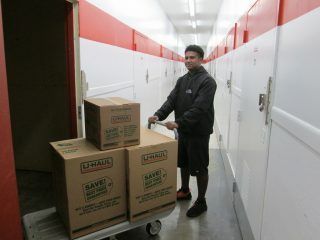 The leader in do-it-yourself moving and self-storage has evolved to accommodate customers as well as Team Members. 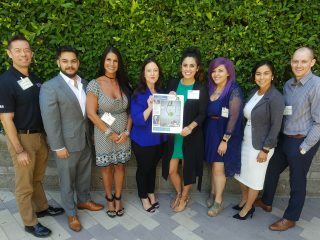 In 2016, U-Haul started The Healthier U initiative to promote more opportunities for Team Members to be happy and healthy. Benefit programs include all-healthy vending options and a bigger variety of healthy café options, discounted gym memberships and incentives to encourage quitting nicotine use. 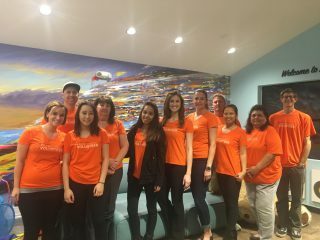 Read about the first U-Haul Active Day in 2016 to learn how our Team Members are staying healthy and fit!